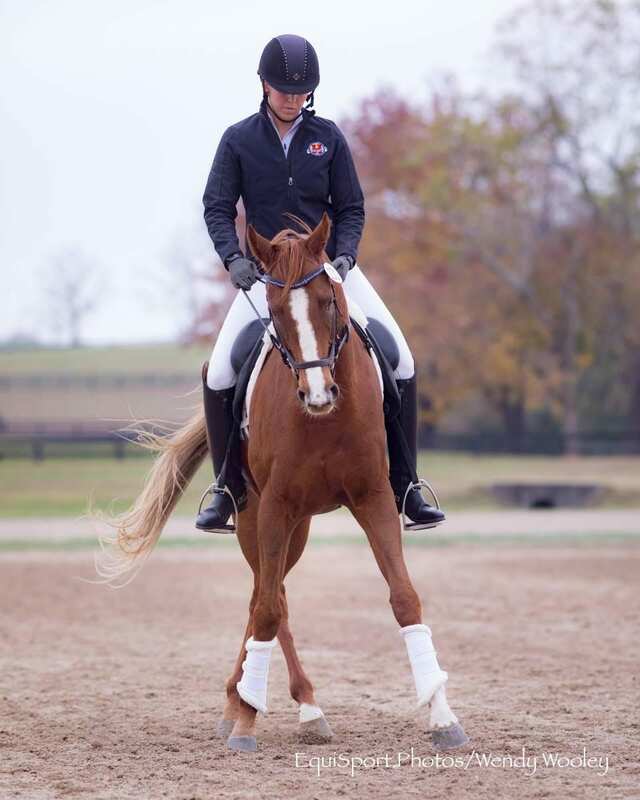 Emily Brollier-Curtis and Dancing Commander, owned by EquiSport Photo's Wendy Wooley, prepare to compete in dressage. Lexington, KY (Oct 28, 2016) – The 2016 Retired Racehorse Project's (RRP) $100,000 Thoroughbred Makeover and National Symposium Finale happens tomorrow, Saturday, October 28 in the TCA Arena at the Kentucky Horse Park. Preliminary competition began Thursday and wrapped up today. More than 300 Thoroughbred ex-racehorses competed in one or two of 10 equestrian disciplines: Barrel Racing, Competitive Trails, Dressage, Eventing, Field Hunter, Freestyle, Polo, Show Hunter, Show Jumping, and Working Ranch. The excitement continues on Sunday in the TCA Arena with demonstrations/clinics, workshops, and seminars presented by leaders in each discipline. In addition to the $100,000 prize money, top professional, amateurs and juniors are competing for the overall title of “America's Most Wanted Thoroughbred”, which will be awarded at 4:45 pm Saturday. The Makeover Party will be on Saturday evening at 6:00 pm in the Big Barn. Tickets are still available and can be purchased at the door. Entertainment starts with Shades of Grass, central Kentucky's favorite horsey band led by Steve Norman, and the silent auction offers unique items of equine, home, and art treasures. Tickets are $40 which includes dinner. Shop, browse, and talk with 80+ vendors in the Sponsor Trade Fair located on the concourse of the covered arena. See the latest technology and products available to keep your horses healthy. Shop for equine-themed products and gifts for yourself, your horse, your farm, and your house. Approximately half of the horses competing are offered for sale. Each have undergone an arrival exam provided by Hagyard Equine Medical Institute. Their veterinarians will also be available to conduct pre-purchase exams. All sale horses are cataloged at retiredracehorseproject.org and buyers are able to test-ride horses at sellers' discretion. Tickets are $10 a day or $25 for a four-day pass with access to all competitions, seminars, and demonstrations. Or, become a member of RRP for $45 (individual) which includes four-day admission to the Thoroughbred Makeover, a subscription to RRP's Off-Track Thoroughbred Magazine, the Retired Racehorse Resource Directory, and other benefits. Retired Racehorse Project (RRP), a 501(C)3, was created in 2010 to facilitate placement of Thoroughbred ex-racehorses in second careers by increasing demand for them in equestrian sports and to help transition Thoroughbreds into second careers.. RRP offers online directories, educational resources, publishes “Off-Track Thoroughbred Magazine”, and holds the annual Thoroughbred Makeover and National Symposium. This entry was posted in Hoof Care and tagged barrel racing, Competitive Trail, dressage, EquiSport Photo, eventing, Field Hunter, Freestyle, OTTB, polo, retired racehorse project, Show Hunter, show jumping, steuart pittman, Thoroughbred Makeover by Paulick Report Staff. Bookmark the permalink.